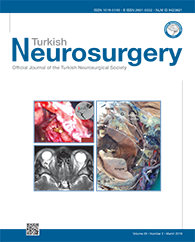 3Korea University, Ansan Hospital, Department of Plastic and Reconstructive Surgery, Ansan, Gyeonggi-do, Republic of Korea DOI : 10.5137/1019-5149.JTN.21333-17.2 AIM: To investigate the outcomes and associated complications after delayed cranioplasty using autologous, cryopreserved bone. MATERIAL and METHODS: This retrospective study included 57 consecutive patients treated with cranioplasty with autologous cryopreserved bone for various conditions causing increased intracranial pressure due to brain swelling. The incidence and risk factor of surgical site infection (SSI) and bone flap resorption were analyzed. RESULTS: The SSI rate was 12.3% and the bone flap resorption rate was 24.0%. There were statistically significant differences in SSI rate in relation to time from craniectomy to cranioplasty (p=0.002) and previous temporalis muscle resection (p=0.021). These factors were also independently associated with surgical site infection (time from craniectomy to cranioplasty: OR 0.901, 95% CI 0.826?0.982, p=0.018; previous temporalis muscle resection: OR 11.607, 95% CI 1.155?116.590, p=0.037). There was also a statistically significant difference in the bone flap resorption rate in relation to previous temporalis muscle resection (p=0.001). This factor was associated with bone flap resorption (OR 11.667, 95% CI 2.276?59.798, p=0.003).